Do You Have A Good attitude - Do you want to Make $1000.00 Per Week ? 1- Good Manners and Smart in Appearance. 2- Well Spoken in English and Arabic Alike, other Languages are a Bonus. 3- Equipped with a PC and Have an E-mail Address. 4- Capability to explain the utilisations of the Internet in the Medical Field. 5- Medical Background is preferable, e.g. in a field of a pharmaceutical sales etc. As an Authorised Medicsindex Sales Agents you will get to be invited to all our Medical Seminars and Public Meetings around the Middle East. Additionally, you are entitled to a handsome Commission paid to you upon signing any contract with any new Client/Advertiser. The Scale of Commissions you will be entitled to will reach up-to 28% of each paid Contract you refer to our Team. Please Visit HOW TO REGISTER to learn more about the Process you have to offer to All New Doctors. Finally, Please Feel Free to E-mail us your contact Details and your Telephone Number and we will be pleased to Call you to discuss further information which you may require. Your Main Duty as a Sales Agent For Medicsindex will entail the introduction of the Medicsindex Site and it's Services to New Medics (doctors), additionally, you are able to contract advertisers from the supportive industries, such as the Cosmetics, Sport, Natural Herbal medicine, physiotherapy, acupuncture, martial arts, health and Beauty Saloons and Gymnasiums, etc. 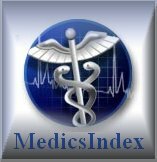 Medicsindex will Pay a generous FEE for every New Profile Added to the Index, up-to 50% of any New Registration.